On top of the Restaurante Salamanca, the temperature says 22 degrees. In the beachside cafe, tourists sit with a jugo de naranja y cafe con leche, carefully guarding their wheelies against opportunistic thieves, but the real action is taking place down underneath the promenade. For the Barcelona retired community, this sunny wednesday morning in early December is perfect for gathering to play dominos and sink a cerveza or two. The mood is upbeat, and why not? 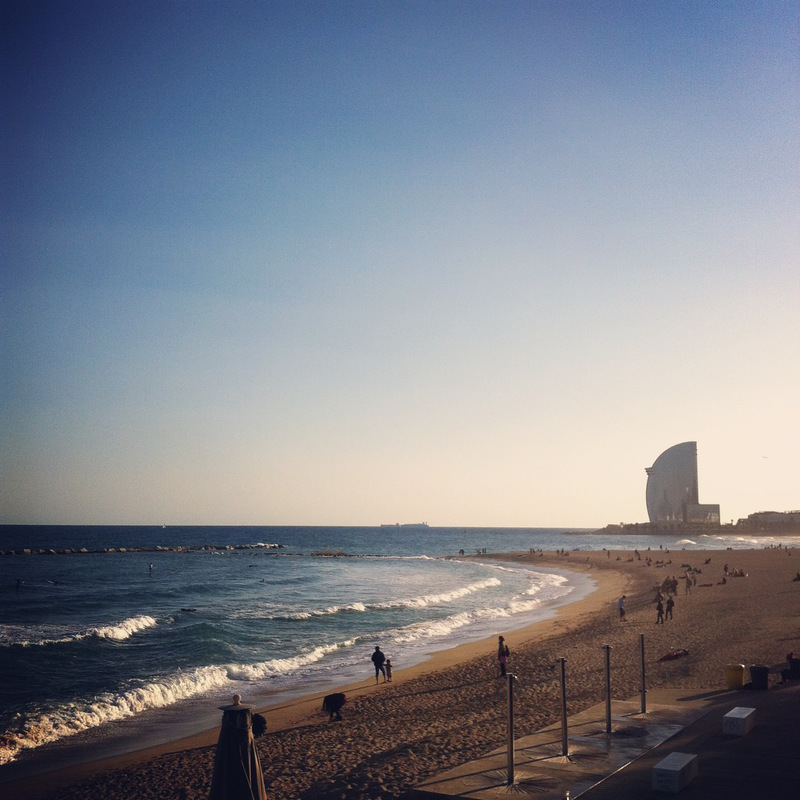 The sun is warm, the sea is sparkling and life expects nothing more from them than this. We, as newcomers and foreigners, are still trying to attune to it. Yesterday was a holiday. A holy day. Unlike in Melbourne, our last adopted home, where the religion is sport and the public holidays coincide with major sporting events, this is the Feast of the Immaculate Conception which celebrates the moment that Mary, Jesus’s mother, was conceived. Husband is still wondering whether to take his allotted day off work, or whether to go in anyway, when a drumming outside our window takes us to the balcony. 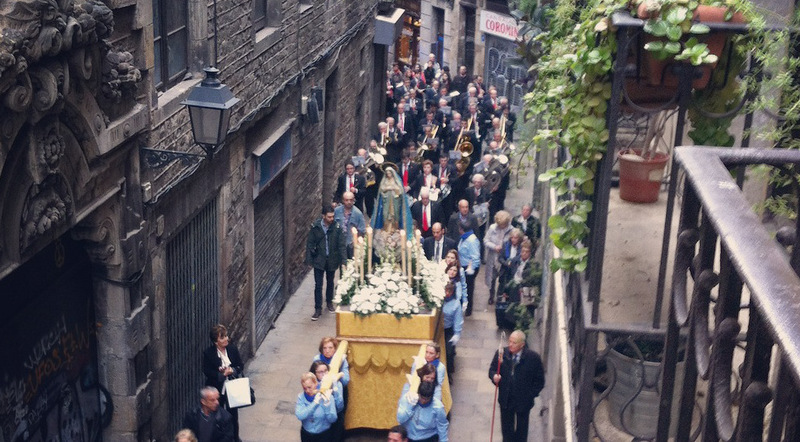 Outside, a procession is snaking its way through the narrow Gotico street and has paused outside the tiny Capella de Sant Cristòfol de Regomir. This chapel honouring the patron saint of travellers has been there since the 15th century, built at the gate in this Roman city wall to which people would bring their prayers before setting sail from the nearby port. 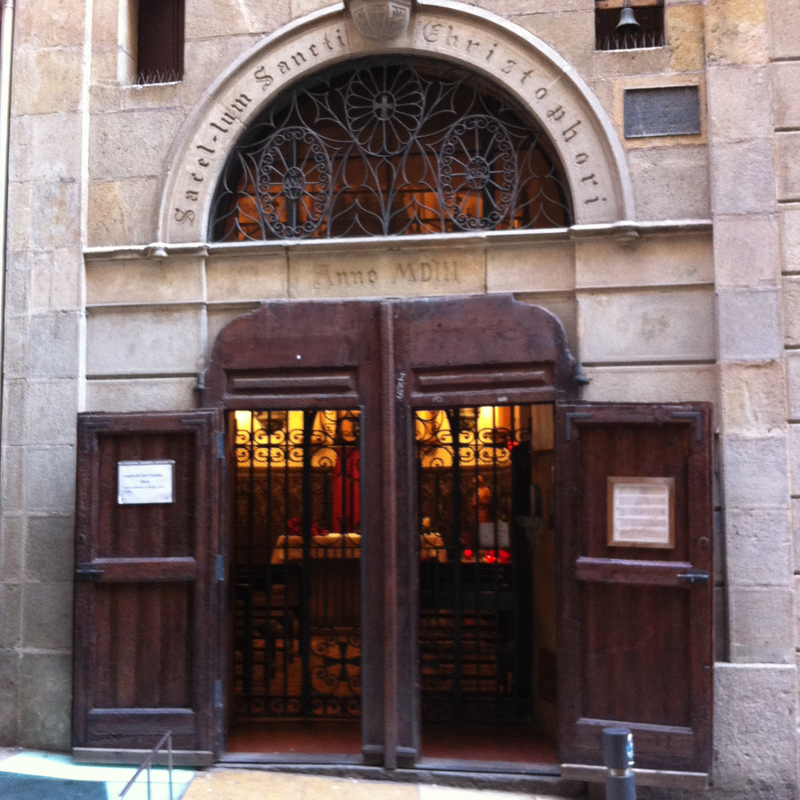 On St. Christopher’s day in 1907, the first cars were brought here to be blessed and the tradition remains to this day, although it still amazes me that cars continue to squeeze through these passageways at all. Today, cars have given way to humans and the procession brings church elders, children, a cohort of trumpeters and finally, majestically, the Virgin Mary herself, teetering down the street hoisted upon a wobbling litter. The porters wear white gloves, but their wrists show strain as the weight of huge carriage shifts from side to side with their gait. Adorned with flowers , the Virgin seems precarious, but the followers follow anyway, tapping their way down the rough pavings with tall, silver-topped staffs. All around, church bells ring out to welcome them, as they must have done for centuries in this ancient city. December 8th is the beginning of Christmas in Spain. The markets are already flourishing, selling all manner of Christmas gifts and decorations, but most significantly, offering rows and rows of caganers, the traditional figures of a little pooping Catalan peasant boy. We first encountered this phenomenon when on a visit to Barcelona a few years ago. In a shopping centre, a huge statue of Santa Claus squatted, his trousers around his ankles and a giant turd on the ground underneath him. We were amazed, not to say confused, and didn’t understand until now that it is a symbol of good fortune. That it represents the fertilisation of crops for a good harvest in the year to come. 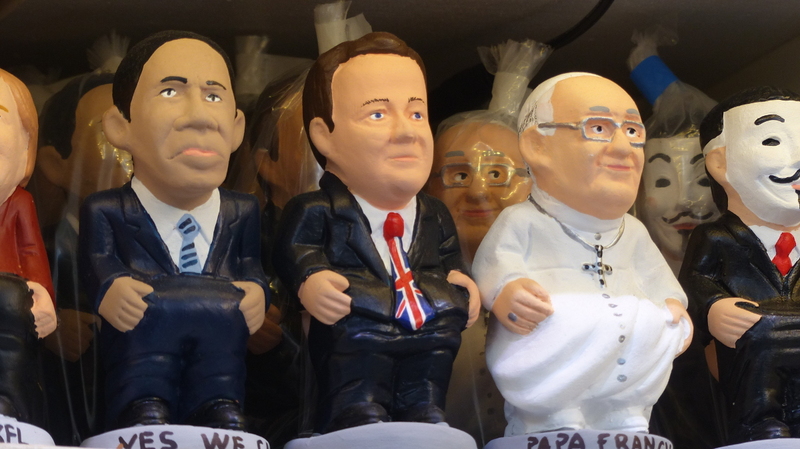 On the market stalls, it also seems to represent a symbol of equality, as now one can buy a pooping statuette of any famous figure, from Queen Elizabeth to David Beckham to the Pope himself. We all do it, of course, and we all need to eat in order to keep doing it. It’s the circle of life and a reminder of what is important to all of us, regardless of our supposed status. I don’t know how many compost toilets are in operation in Barcelona city. The waft of sewer-smell that drifts past my nostrils from time to time suggests not many, but who knows, with this symbol so widespread in the popular imagination, perhaps there is room here for a humanure revolution. The collected waste could be transported out to the Catalonian countryside and used to grow nutrient-rich soil. As floods rage in the UK and bushfires rampage through Australia, climate change is most likely to effect Spain by way of drought. Perhaps, by turning towards dry composting toilets, we also could stop needlessly flushing drinking water away and the pressure on Barcelona’s sewage system would be – ahem – relieved.